Protecting their retirement nest egg, dividing property and writing a will are the big steps that most people consider when they start their estate planning. Whilst taking care of finances is important, it’s only one part of a complete end-of-life plan. There are other areas that may need to be considered as well, such as future medical care, online accounts and funeral plans. Medical research and technology are helping many people live longer, healthier lives. However, our health still declines as we get older, and a sudden illness or accident could unexpectedly impact your quality of life long before old age. That’s when an advance directive could be important. An advance directive is a legal document that records instructions and wishes for your future medical care. It can also grant another person power of attorney to make important decisions for you if you’re unable to make them yourself. The advance directive would act as a guide for your doctors and family in some worst-case scenarios, such as falling into a coma or developing Alzheimer’s Disease. It can also outline more everyday plans, like where you’d like to live or what medical office to choose. Thinking about your online presence after your death is a relatively new concept. But as our computers and smartphones become more important, you might need to make plans to secure the digital assets they protect—everything from financial statements to treasured family photos. After you’ve passed (or if you’re ever left unable to make your own decisions), your family may need access to information you’ve stored on your computer or in the cloud. They might also need to log in to your email accounts or social media profiles. We don’t recommend sharing passwords with anyone (no matter how much you may trust them! ), but there are steps you could take to help your family when the time comes. This might include listing important usernames or online accounts in your Will or backing up files to an external hard drive. Unless you’ve previously arranged a funeral, the cost of even a basic service may shock you. In many countries, the price could top over $10,000 depending on the individual prices of things like choice of casket, a cemetery plot and burial or cremation fees. Finding the money to pay for all this—often on short notice—might be difficult for your loved ones. To help, part of your estate planning could include arranging money to be used for your final expenses. A funeral insurance policy is one way to do this. Unlike a pre-paid funeral plan, you don’t need to make any decisions about your funeral, such as choosing a funeral director or selecting where you’d like to be buried. The funeral cover benefit can be used however your family sees fit, whether that’s helping cover burial costs, closing out any final debts or taking care of household bills so they can take time off work to grieve. Beyond the cost of a funeral, family members sometimes face other challenges when arranging the service. They often want to do what their loved one “would have wanted,” but not know what preferences (if any) that the deceased may have had. Sharing any funeral wishes you may have with your family could help them make these important decisions after your death with more confidence. You may want to discuss things like a preference for cremation or burial, what you’d like on your headstone or who should speak at the service. If you or your family are uncomfortable discussing these matters now, you might decide to write them down and give a copy to someone likely to be involved in the planning. That way, the information is there when it’s needed. 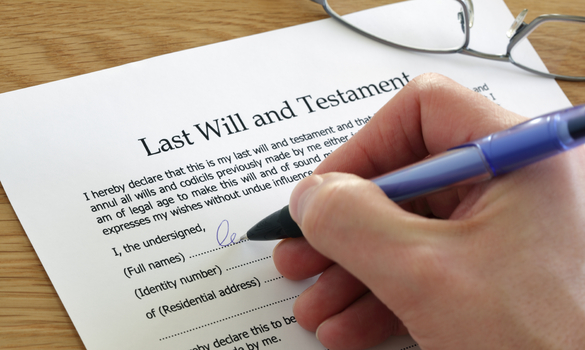 Estate planning can be about more than just deciding who gets what after you pass away. A complete plan might also include instructions for future medical care, granting access to your digital files or even thinking about your funeral. By giving these areas thought now, you might make it a little easier for the ones you love to handle this difficult time.